Oven Mitt Ove Glove makes it possible to never burn your hands again while cooking! Dont you hate when you are reaching in the stove for a pan of cookies and your oversized oven mitt falls off? With the new Oven Mitt this will never happen again. Oversized thick oven mitts are way too big for your hand and make it impossible to get a good grip on pans. Made of NOMEX and KEVLAR material, the Oven Mitt Ove Glove increases the time you can hold extreme hot pans. 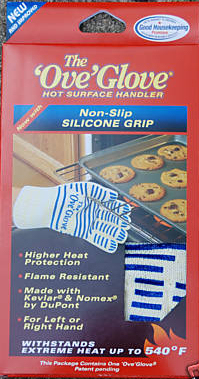 Oven Mitt Ove Glove will NOT catch fire or even melt when exposed to open flame. The Oven Mitt Ove Glove is also machine washable! The Oven Mitt Ove Glove can withstand extreme heat up to 480 degrees! The Oven Mitt is perfect for baking cookies, grilling out, and changing light bulbs. Comfortable five finger Oven Mitt Ove Glove that fits either right or left hand. You'll never have to worry about your credit card information if you order from our oven glove site.